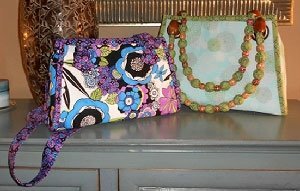 Sophisticated purse in two sizes – Small is 13” x 8” x 3”. Medium is 15” x 10” x 5”. Both sizes have a zippered divider in the center and four inside pockets. There are several handle options including fabric/beads, grommets or D-rings and tabs. This is a perfect showcase piece for your fabulous fabrics.